Nissan Australia has signed a Definitive Agreement (DA) with the Victorian Government for the supply of 16 new Nissan LEAF electric vehicles. The Nissan LEAF EV's will form part of the government's five year trial for zero emission vehicles which will explore how electric vehicle technologies will perform an evolutionary step and provide a broader product portfolio (along with advanced petrol and diesel power). The Nissan LEAF which goes on sale in world markets before the end of 2010 is a zero emission, battery only medium size hatch. Powered by Lithium-Ion batteries, the LEAF will have a fully charged range up to 160kms - perfect for zero emission city commuting and suburban use. 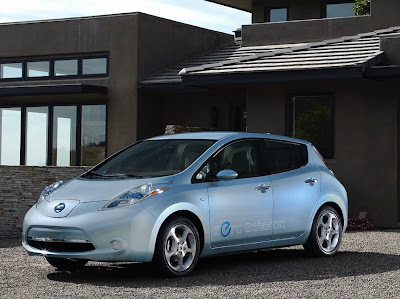 The Nissan LEAF is expected on sale in Australia by 2012.
technology providers to assist in data collection and the interface between these various participants. Private households are being invited to take part in the electric vehicle trial through an online ballot being conducted by the RACV. impacts of the use of electric vehicles on driver behavior, recharging, vehicle performance and efficiency; and the potential implications of electric vehicles for electricity consumption, management of electricity demand, greenhouse gas emissions and air pollutant emissions. The trials will assess how a range of different providers would interact, reflecting the variety of providers likely to develop in the market and help position Victoria as an electric vehicle-friendly location, according to the State Government. The Department of Transport says it will be working with the RACV to find households to participate in the trial. Expressions of interest for people who would like to be part of the trial are expected to open in late September, and will be handled through the RACV website. The DA follows the signing of a Memorandum of Understanding, signed by Nissan and the Victorian Government last year which committed both parties to a common goal of electric vehicle sustainability and the infrastructure and technology needed to move the State to a lower emission future. Deliveries of the Nissan LEAF to customers begin in the United States and Japan in late 2010 and in Europe early next year. A version of the medium-sized zero-emission hatch is scheduled to appear at the Sydney Motor Show and in Melbourne at the All Energy Conference this month. The Nissan LEAF is likely to be the first in a series of electric vehicles from Nissan. Company officials have already flagged future Nissan electric vehicles might include a delivery van, personal commuter car and a luxury vehicle derivative. Nissan Australia CEO, Dan Thompson said Nissan was forecasting that at least ten percent of the world's vehicle population could be electric powered within ten years. "As the world seeks a solution for rising emissions and desires less reliance on fossil fuels, automotive power will increasingly turn to alternative energy. Electricity for zero emission mobility is clearly the preferred option," he said.